Hello! Now, I’m not sure about you but as soon as September 1st rolls around, my skin decides it’s Autumn and goes pretty darn unpredictable. It’s always been combination, but colder weather means it can sway either on the dry side or oily side pretty much every other day. So finding skincare which is hydrating, yet doesn’t turn my face into an oil slick is pretty much all I’m on the hunt for until Spring. Obviously, moisturisers go a long way in protecting the skin as the temperature drops and my current favourite go to is the amazing REN Vita Mineral Emollient Rescue Cream. It’s a really intensive balm that you have to warm up slightly to use, but works as the most wonderful intensive treatment resulting in hydrated, supple and smooth skin. A winter must have! As for treatments, I’ve been swapping between Kiehl’s Midnight Recovery Concentrate (reviewed here) and Aromatherapy Associates Revitalising Face Oil to give skin an extra boost of moisture overnight. I’ve been trying the Hirons Method (so it shall be named) of taking my makeup off as soon as I get home, applying my skincare and reapplying the heaviest product if it’s sunk in before I go to bed. This has been working so well while using the above two products, not a dry patch or feeling in sight! As for extras, I’ve been using Bobbi Brown Hydrating Eye Cream during the day, as it’s light enough to sink in quickly, but does pack a fair bit of hydration. And, of course, as a mask addict I had to include Aromatherapy Associates Soothing Treatment Mask, which adds moisture to the skin while giving it a radiance boost at the same time. I love the way it leaves my skin and I’m finding myself reaching for it more than any other hydrating/brightening mask I own (which says a lot, as I have an entire drawer full). Definitely worth the investment! 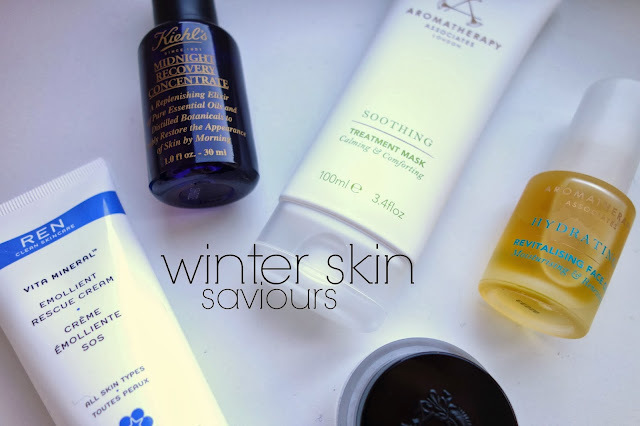 So that’s all of the products I’d recommend to keep any dryness at bay in the colder months. I’m always on the lookout for hydrating yet balancing products, so may update this post or do a round two if I find anymore for you all. Which products do you rely on in winter? Any you could recommend? Make sure you’ve entered my Origins giveaway! You can win a trio of products.